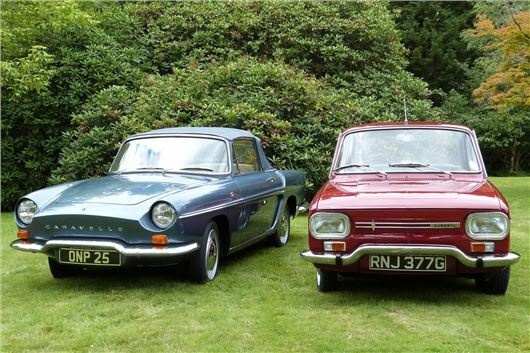 I wondered how different car manufacturers get away with using the same names: Renault Caravelle/Volkswagen Caravelle; Jowett Javelin/AMC Javelin; Triumph Toledo/SEAT Toledo. Car manufacturers copyright long lists of names for cars that they may or may not use in the future. Renault must have ditched Caravelle after the Dauphine derived model. Triumph must have stopped paying to keep 'Toledo' and anyway it's more logical for SEAT to have it. Jowett has been defunct for 60 years and AMC is now as well. Sometimes names are revived. For example, Ford used Cougar for a Mercury model on the 1960s and 1970s, then for a Ford coupe in the 1990s, and now uses Kuga for its medium SUV. For over 23 years I have driven 4 separate BMW 3-Series cars as my main vehicle. Only one of them was a diesel. I love the concept and the driving experience. But my wife and I will be 77 this year and we are finding BMW cars increasingly difficult to get in and out of because of the low seats. We both need to change to a vehicle with higher seats and taller doors. I like your reviews of the Skoda Yeti. Skoda must be doing something right if so many taxi owners and police forces use them. I would probably go for the 1.8 petrol engine rather than a perhaps overworked 1.2 since we don't do too many miles and the fuel consumption isn't that critical. A pity that VW doesn't make a ‘body-copy’ like they do with the Up and Citigo. I need a more comfortable ride. BMWs used to be more comfortable before they fitted run-flat tyres with their rigid walls. I have looked at BMW X1s and X3s but the rigid tyres are there again and there don't seem to be any petrol versions available. Doesn't have to be a Skoda. Almost any make will do. What is there, around 1-3 years old, petrol, with easy access and 4 good seats that are higher from the ground than BMW? I really need Cruise Control but can do without SatNav because my TomTom unit is better than any built-in GPS that I've seen. Budget can be £12,000 to £15,000. The best Yeti was always the 1.8TSI 4x4. Drives and handles better than a Golf GTI. You'll easily get a used one within budget: /road-tests/skoda/skoda-yeti-18tsi-160-2009-road-test/ The Yeti in its present form is near end of life and actually Skoda makes the SEAT Ateca for Skoda in the Czech Republic. If you had a bit more money, one of those with the 1.4TSI 150 engine might suit you. Alternatively, the best riding, best handling SUV is the new Toyota C-HR: /road-tests/toyota/toyota-c-hr-2016-road-test/ but that is definitely over budget. My arthritic daughter is looking to replace her Renault Clio. Which automatic would you recommend, Toyoto Aygo, Citroen C1 or Peugeot 107? None of these because they are all automated manuals, not automatics. If she wants a small car with a proper automatic transmission, then a Suzuki Splash/Vauxhall Agila (went out of production 2 years ago), or a new Hyundai i10 or KIA Picanto auto. I was looking at this car..http://www.bob-gerard.co.uk/used-cars/honda-jazz-1-3-i-vtec-se-cvt-5dr-startstop-great-glen-201608036455568 It is at Bob Gerards in Great Glen, only a few miles from me. I have seen it. The number plates are just for show, it is apparently, completely unregistered and brand new. I would like to ask you please, if it is an import direct from Japan and brand new, would that give me any problems with insurance, warranty etc? Also, it is a CVT automatic, I have driven automatics in the past, but, at age 64, should I change from a manual to an auto? Only thing that bothers me are the amount of accidents people have because they have put their foot on the wrong pedal. I nearly got run over by one who did just that, a few years ago. It is a CVT, so would that be reliable. It looks a good price. I have a Honda Jazz 1.4 EX that I bought Sept 2010 and it cost me £14,000 then. So, I would probably trade in my Honda Jazz that has only done 33,000 mile. (I have another vehicle as well: a 1998 VW Transporter 2.5TDI.) I suppose, I wouldn’t get a wonderful trade in as this garage sells quite cheaply. They can only get brand new Honda Jazz’s in automatic guise. Should I do it or just keep my old Jazz? My main reason for thinking of changing now is that the VED on the new Jazz is £20 or £30, I believe, which of course, will not be available after April 1st this year when everything will be at least £140. I do a lot of short journeys so do not want a diesel. My Transporter is OK as a diesel as it is old enough to have never had a DPF. Bob Gerard has a good reputation and at £13,000 the car is cheap. It's on 15-inch wheels that are better than 16-inch wheels for ride comfort and the photos show it has the very necessary paddle shifts. You still need to check what sort of warranty you will get, and what sort of penalty your insurer will impose. There's no problem driving an auto. Two pedals: two feet: no confusion. By left foot braking you always retain total control and can stop on a sixpence at low speeds. Last week, following an annual service of my 18-month old E Class Mercedes at Robinsons in Bury St Edmunds in Suffolk, it was identified that I had unusually severe wear on the inner section of the front outside wheel tyre where canvas was exposed. The rest of the front tyre width had tread depth of around 3mm. It was recommended that I replace the tyre urgently and also have a four-wheel alignment check completed. I preferred to use my own local tyre supplier and subsequently arranged for the work to be completed the following day. The alignment check cost me about £100 and clearly identified an issue with the camber on the OS front wheel, however, I was informed by the technician that he was not able to adjust the camber as Mercedes had fitted straight bolts to the suspension points. Needless to say I thought he was joking as this was the first time in the last 45 years I have purchased a car (old or new) with suspension that could not be adjusted (camber and toe-in, and this was the most expensive car yet. It prompted a rather interesting conversation. Clearly, given the state of Britain’s by-roads, it is essential that cars are fitted with suitable suspension adjustment and I can only think that this is a dreadful oversight? I complained to Robinsons who have kindly agreed to finance the replacement adjustable bolts (again about £100) which will now have to be retrofitted, but clearly this is an issue that should be dealt with and financed by the manufacturer. I have tried to find an email address at MB design and perhaps not surprisingly have failed to do so. This is clearly a question I now need to ask in future when replacing the vehicle and which may well influence my decision but can you advise me as to whether this is now common practice among manufacturers/suppliers. My son is storing his Mazda sports car on my driveway for the next 3 months. I would like to get a car cover to protect it but am concerned that condensation might collect underneath the cover and cause damp and corrosion . There are numerous types on the Internet. Can you recommend a suitable make? Also advise if I should put anything between the body and the cover. The words to look for are 'Breathable Car Cover'. They are usually lined with fleecy type stuff. I can't recommend my DuPont cover because it's no longer made. You can help by removing the cover on warmer, dry days and chamois leathering off any collected condensation. Crucial, however, to tie it down with a length of clothes line (as I have learned to my cost). Car covers collect even the slightest breeze, like a sail, and are highly prone to blowing off and down the street. My wife wishes to buy a Mercedes GLA petrol 2.0 litre with satnav and heated seats. List price is just over £29k.The Mercedes dealer has told her that they have stopped production as the facelifted model is due any time. There are apparently only two unregistered new A Class on the Mercedes national list. He offered a 10% discount without asking. Do you think that we should negotiate a higher discount as these cars are the last in the line? I am disabled and need a car soon with a very adjustable driving position. I would be happy buying an older car and am likely to be doing low weekly mileage now. I don’t care about fuel consumption; only comfort. I have a 2015 Lexus IS300h fitted with 225/45 R17 Bridgestone Turanza tyres as standard. Very noisy. Now running with Michelin CrossClimate on 16-inch wheels for winter. Noise better but car feels unstable at speed. What about the new Conti PremiumContact 6 on 17-inch wheels? Your comment that the car feels unstable at speed is peculiar. First, check that the Cross Climates are all on the right way round (they are directional tyres). If they are, try reducing the pressures. I ran a Honda HR-V on them for 10 months and 10,000 miles at cold pressures of 31PSI all round and they were excellent. Quiet, soft riding and giving far better steering feel, which a Lexus tends to need. The automatic Stop/Start on my 18-month old KIA Picanto 2 Ecodynamic has not worked correctly from new. The car has been back to the Dealer several times who say that they cannot find a problem. They do some "boosting" of the battery and the system works for two or three days before failing once again. This car is used in an identical pattern as was the previous Picanto which performed without problem for three years. Having been assured that the battery is perfect and that no drain can be found my belief is that the Alternator is not functioning fully. The Dealer disputes this and KIA Technical Department are of no help. Any thoughts? You're probably not doing enough mileage for the battery to charge sufficiently. The newer car will have a different type of alternator that charges on the over-run (rather than all the time) to save fuel. Having read your enthusiastic reviews of the Hyundai Kappa 1.25 engine, I test-drove a new i10 SE last year and liked it enough to buy one. It has proven to be an excellent machine and suits its mainly suburban and day trip uses perfectly and so far is proving to be one of the best cars I have owned. So thanks for that. We subsequently replaced my wife’s old car with Suzuki Celerio and I noticed that its 1-litre 3-cylinder engine produced exactly the same power and torque as Hyundai’s 1-litre 3-cylinder, but is significantly more economical, shown by the HJ Real MPG data. 1-litre Hyundai i10: 50mpg; Celerio: 62.8mpg. I know this will include a non-specific number of Celerio Dualjet engined cars but we are bettering this overall figure with a standard engine, measured brim to brim. I was wondering why and, searching for some clues, I found this site that lists car specs from 1945 up to the present. http://www.automobile-catalog.com/ Unfortunately the site is still under construction and has not yet reached manufacturers beginning with the letter S, but I found a graph somewhere else. The Celerio engine had quite a flat torque curve and this feature is very noticeable in town traffic where the engine pulls cleanly over a significantly wider rev range than our Hyundai i10 1.25, which needs to be revved more. Interestingly, although our Hyundai 1.25 pulls much more strongly above 3,000rpm than the Suzuki 1.0, the Suzuki’s wider torque band seems to allow it to pull higher speeds for given revs: 60mph in second and 70mph in 5th at 3,200revs whilst our Hyundai 1.25 needs around 3,500 revs to attain the same speed. If the Hyundai 1-litre engine has a similarly peakier torque even though produced at lower revs than the 1.25, perhaps this goes some way to explaining why the very similar Suzuki engine, on paper, seems to be 25% more fuel efficient than the 3-cylinder 1-litre Hyundai engine. What you could do is try Shell V-Power Nitro Plus in the i10. That will give you more torque at low revs so you can change up earlier and save some fuel. The 62.8 from the Celario is outstanding. http://www.automobile-catalog.com/ reads like a labour of love. After all that work I hope they can monetise it. You advised me recently about the cambelt for my 2007, 175,000 mile Octavia Scout. Now the climate control seems to be playing up. I am 78 years old, want to continue to drive and have a large Labrador. I should like another Scout but wonder if there is anything comparable and safe that is less expensive. Up until now the Scout has been wonderfully reliable and I like the 4x4. I am the second owner of a 2012 F11 BMW 520d M Sport Touring auto, with 51k miles and a full main dealer service history. The manufacturers' warranty has expired, can you advise me on the best value extended warranty available with approx. cost, and will it apply if there has been a break since the factory one lapsed please? I cover approx. 20k miles per year, and am aware there is a lot of bad press with timing chains on the N47 engine fitted to my car, so need to ensure that if I was ever affected then I am covered. I had a bad customer experience with BMW on my previous vehicle (an E61) with a premature major mechanical failure, so I am wary that they would offer the best value to me over an alternative for this level of cover? Any help or advice will be greatly appreciated. The three main warranty providers are Warranty Wise, Warranty Direct and Motoreasy. If there has been a break between manufacturer warranty and the aftermarket warranty you will not be covered for the first 3 months in case you took out the warranty to try to cover a pre-existing fault. You may not be covered for the timing chain anyway because tensioner wear is a known problem and could be treated as wear and tear. I'd be more inclined to look at a BMW warranty from the dealer you bought the car from, if it can still qualify, and make it a specific condition of the warranty that timing chain and tensioner are covered. I am hoping that you can assist me. At present I own a 2013 Skoda Fabia Estate, which just fits my garage width-wise. I am looking to change it for a used hatchback of similar dimensions or very slightly larger. Any suggestions would be gratefully received. The way to go with that is a Skoda Rapid Spaceback: /road-tests/skoda/skoda-rapid-spaceback-2013-road-test/ Width (excluding mirrors): 1,706mm; Width (including mirrors): 1,940mm. We have had a Skoda Yeti for five and a half years and my husband thinks it’s time to change the car before any major service items need work, such as battery, etc. I like the Yeti because it is not too big, has a higher driving position and I can see all four corners so visibility is good, driving is pleasant and is parking easy. Our access is restricted and many cars are too wide to fit easily. We have looked at numerous alternatives: 2008, Ateca, Vitara, HR-V, Captur, Kadjar, etc. but I they are either too big for our needs or the design seems to reduce visibility out of the rear windows. Would we be stupid to buy another Yeti knowing it will be replaced next year? We have had some really good offers to change from Skoda dealers, so it is tempting. If that's what you want, up to you. Better petrol than diesel, though, unless you do a huge mileage. The Yeti 1.8 4x4 was always the best Yeti of all, though production of it has been spasmodic. I tested the same Yeti 1.8 4x4 that Jeremy Clarkson put through a destruction test on Top Gear and I guess I had it after him. I have a 2001 Honda, which is still going strong and has been a great car, they used to be described as "dull and reliable", but that suits me. However, I am aware that it is getting a bit long in the tooth. The new Civic is huge and I certainly don't want a bigger car. I like the hatchback and also the VTEC. Any suggestions for a replacement? The Jazz 1.3iVTEC manual is a bit underpowered and undergeared. The Mk II Jazz 1.4iVTEC was better. Alternatively, look at a KIA cee'd or a Hyundai i30 (or the smaller new model KIA Rio or Hyundai i20). Regarding the item on the Suzuki Celerio's fuel economy, I can add the following... I used to drive a 2013 Kia Picanto 1.0L manual (same engines as Hyundai). I drive like the Pope's mother and the best that I could get out of it was roughly 55 mpg (averaged over 18,000 miles). This was a real disappointment as it was worse than my old 2006 Daihatsu Sirion and the wife's 2005 Aygo MMT (both gave around 60 mpg). It was also disturbingly getting worse over time despite regular servicing. Then we replaced the wife's Aygo with a Celerio SZ4 AGS (which 90% of the time I drive). The difference in fuel economy was immediately apparent. Over the last 4000 miles it's averaged 69.9 mpg but it has hit 74.8 mpg on long motorway trips. I was so impressed, I got one for my daughter-in-law and one for myself. I've only got mpg figures for one tankful on mine but it did 66.7 (but this was over Dec/Jan which is pretty good considering how cold it's been). Also for contrast, early last year, I helped my daughter buy a brand new i10 Premium Automatic (with the 1.2 Kappa engine). She gets a pathetic 38 mpg (although she does drive faster than I do). From the above comparison, IMO, Suzuki's overall approach to making small cars is far superior to Kia/Hyundai's. The latter promises good fuel economy but doesn't deliver it. Suzuki does. We have averaged 53mpg over 7000 miles in our Hyundai 2016, 1.2 manual which is slightly better than the average for the 1.0 and 1.2 on HJ’s Real MPG stats. There does not seem to be a significant difference in fuel consumption between these two engines with manual transmission but with an auto box, consumption increases to a seriously disadvantageous 38.1 MPG. on HJ RMPG. The Celerio 1.0 AGS (auto) is even more economical than the manual version, according to RMPG. W... C.. (sorry HJ) has developed its own version of the HJ more realistic fuel consumption idea, which they call True MPG. Even with a’ lowly’ fuel consumption of 57.8 MPG. You need a few driving tips from HJ readers lads!